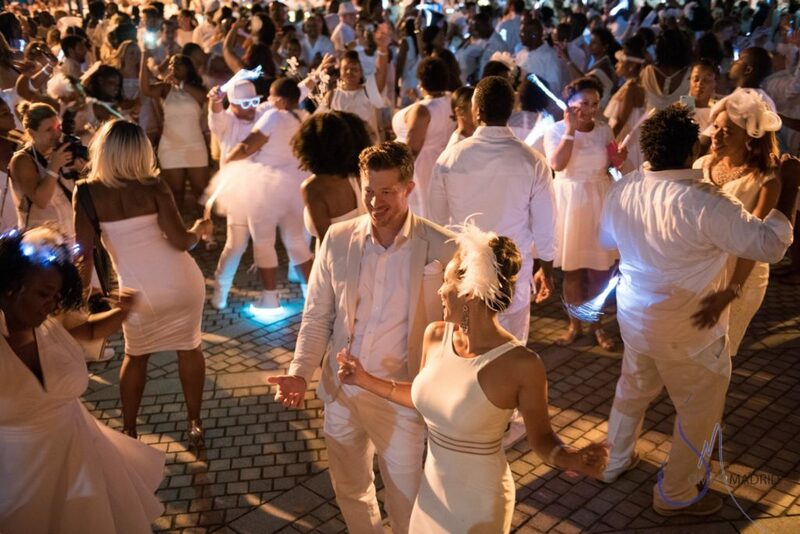 Having attended two Dîner en Blanc events in Washington DC, I am here to share with you some helpful information and tips I have learned along the way. In 1988, a man named François Pasquier decided to invite his friends to a picnic in Parc de Bagatelle in France. In order to find one another, they all wore white. Having had such success, the group of friends decided to make this an annual event. Inviting new friends each year, the free event organically grew from 200 to 1,000 to over 10,000. With such a large gathering, it became necessary to conceal the location of this dinner. Over time, the event spread internationally and evolved into the dining adventure that it is today, an exclusive pop-up dinner held annually in a secret location. Invited guests are assigned to specific meet up points around the city. Volunteer “point-people” will then lead their group of guests through the streets to the secret location. Following a “leave no trace” model, guests set up their elaborate tables and decorations, dine, drink, and dance. When the music has stopped, everyone packs up their table, chairs, and belongings, and returns to from wherever it is they came. It is as if nothing ever happened. 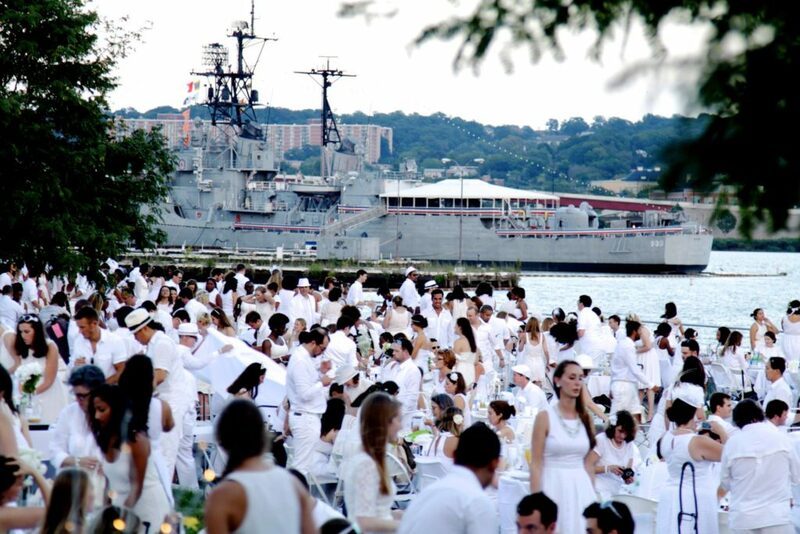 In the years following the first picnic in 1988, Dîner en Blanc events have been held in over 80 cities in 30 countries around the world. The Inaugural Washington DC event was held September 4, 2014, at Yards Park, along the Capital Riverfront. Since then, the event has been held at the Carnegie Library, at the foot of the Lincoln Memorial, and right smack in the middle of Pennsylvania Avenue near the Capital Building. Any guesses as to where it might be next year? Whether you are a friend, foodie, or fashionista, entrance does come with a $40 transaction fee plus a $9 membership fee. The event was originally founded as a free affair to bring people together. Organizers strive to keep costs at a minimum, however, there are still logistical and legal costs associated with holding such a massive event in a very public venue. 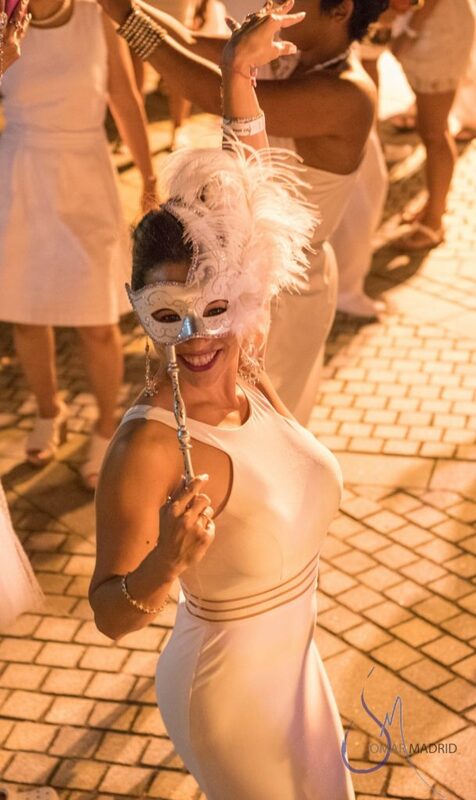 Dîner en Blanc International asserts that the transaction fee goes toward the inherent costs of security, music, permits, and public event costs. The membership fee allows members access to online services, as well as permission to register for as many Dîner en Blancs in the world that they wish. Because the event follows the premise of “leave no trace”, guests are required to manually CARRY everything in and CARRY everything out. I emphasize the word “carry” because figuring out how to carry a table, chairs, food, decorations, etc all in your arms, will require a bit of planning. One lesson that I quickly learned is to bring a utility dolly, depending on how much you have. 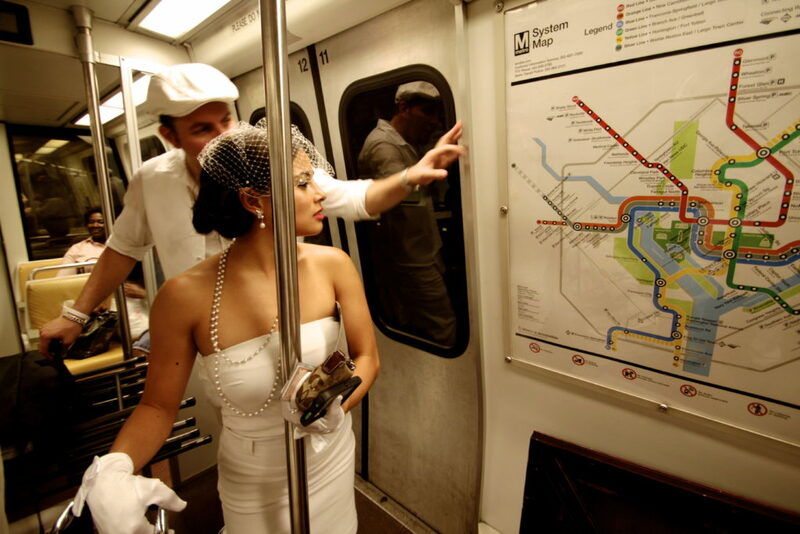 The first year I went to Dîner en Blanc, we had to go through 3 metro stations during Friday rush hour. Not having a dolly, we had to manually carry our massive load of supplies up and down elevators and into packed metro trains. While I was a complete sweaty mess, the couple next to me were relaxin’ all cool with all of their belongings neatly secured onto one dolly with one bungee cord. Lesson learned. Taking the crowded metro to Dîner en Blanc in the middle of rush hour. Not fun. The event is not a casual affair, but rather an opportunity to dress extravagantly and drink champagne all night with your pinky up. Furthermore, this is emphasized by the organizers who enforce a strict policy of dressing “elegantly stylish” in all white. No t-shirts and hoodies allowed. This is an opportunity to express your creativity to the full extent, so take advantage of it! I have seen men and women wearing tall Parisian wigs to match their powdered white faces and pantaloons, there are women dressed as flappers and elegant brides with birdcage veils. Accessories are abounding with white swan hats, costume jewelry, feathers, and canes. The decision to dress conservatively or ostentatiously is yours, however, I say go big or go home. Either way, do bring a pair of flats to walk in. The walk from your meeting point to your secret destination can be anywhere from 5 minutes to 30 minutes. As per instructions from the organizers, pack a gourmet meal. You will not see any orange Popeyes chicken boxes sitting on the table…although I do love me some Popeyes. There is usually a bit of time between when you are seated and when the official meal begins. Therefore, I have found that it is nice to pack an appetizer as well as a meal and dessert. You have a few options when it comes to choosing your meal. You can: 1.) prepare and pack your own food 2.) purchase your food to-go from a place like Dean and Deluca, Whole Foods, or any restaurant of your choice 3.) 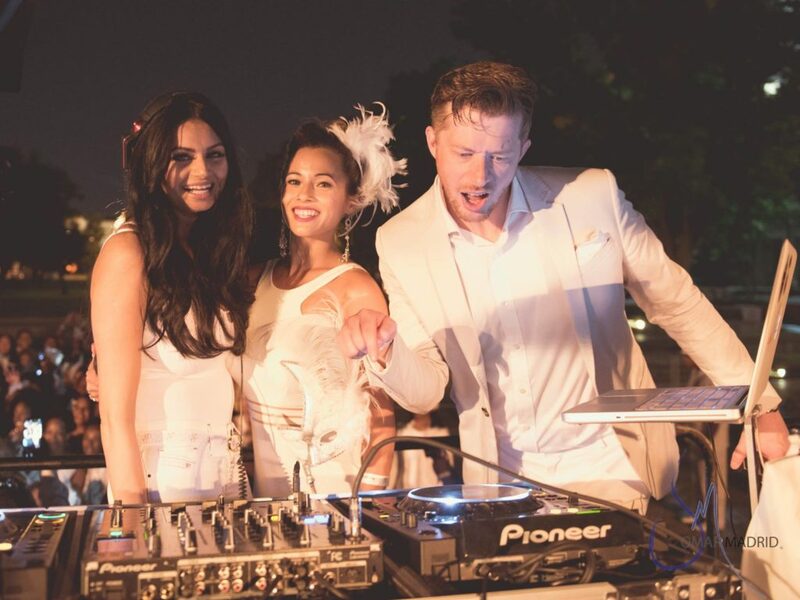 purchase your meal from the Dîner en Blanc sponsored caterer. If you choose option 3, you can pre-order your meal and pick it up at the actual event. While option 3 is easier in the sense that it is one less thing to carry, the line to pick up your meal can also be incredibly long (imagine 4,000 people waiting in line to pick up their meal). 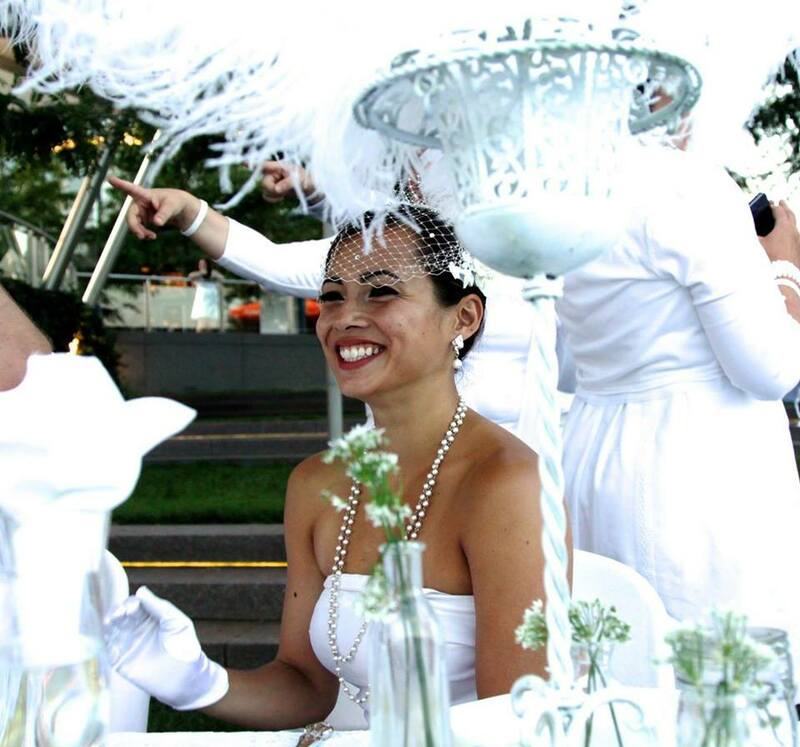 Washington DC’s Dîner en Blanc is a purely magical event set against the backdrop of some of the Capital’s most beautiful landmarks. Successfully organizing 4,500 people for such an event does take significant planning, both on the part of the organizers and the guests. Be prepared for some last minute chaos. You may struggle to carry everything you brought on the journey from meet-up point to secret destination. Imagine a candelabra under one arm, tablecloth dragging on the floor, and a cooler dropping and spilling everything onto the floor (yes, this was me the first year). Or perhaps there is some confusion among the volunteer “point-people” on where they are supposed to be taking you (happened my second year). Just know, that all of the chaos is part of the adventure. The temporary chaos is fleeting, and before you know it, you will be enjoying an amazing dinner surrounded by 4,499 new friends in the middle of the nation’s capital. 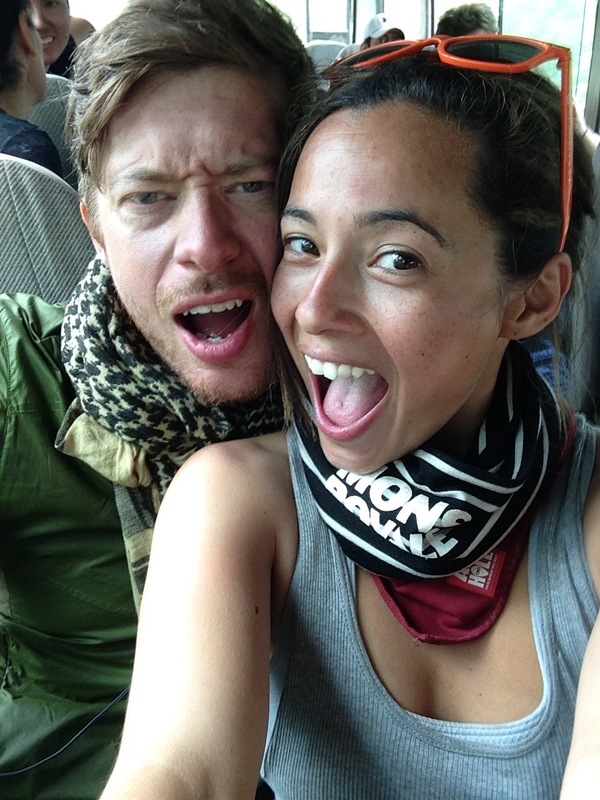 Cecilia is a bubbly Filipino-American with an affinity for constant change...that or a 10 second attention span. Refusing to sit still, she travels the world, in pursuit of adventure, excitement and meaningful experiences. She holds a Masters degree in International Development and Public Policy, and a BA in Business Management.